FOZ DE IGUAÇU, Brazil , Dec 20 2013 (IPS) - As they build huge hydropower dams, the Brazilian government and companies have run into resistance from environmentalists, indigenous groups and social movements. But the binational Itaipú plant is an exception, where cooperation is the name of the game. Involved in a total of 65 environmental, social and productive activities, the Cultivando Agua Boa (Cultivating Good Water – CAB) programme is led and supported by activists. Sectors of the government are considering using it as a model to be replicated in other major infrastructure projects, to mitigate impacts and conflicts. Compared to what is happening in the rest of the hydroelectric dam projects, “it’s a stride forward,” said Robson Formica, head of the Movement of People Affected by Dams (MAB) in the southern state of Paraná, where the giant Itaipú hydropower complex is located on the border between Brazil and Paraguay. Itaipú Binacional, the company that operates the hydroelectric plant, decided to guarantee efficient long-term electricity generation by caring for the Paraná river basin to ensure both the quantity and quality of the water. That has paved the way for cooperation with environmentalists. More than 80 percent of Brazil’s electricity comes from its rivers, which means the country’s energy security depends on rainfall and on the best possible use of water. Itaipú’s CAB programme was launched in 2003, two decades after thousands of rural and indigenous families were displaced in order to flood their land and fill the 1,350-sq-km reservoir. The dam is the world’s largest hydroelectric power producer. “They fail to establish a policy for local development, or for structural changes in the area in question,” added the head of MAB, which estimates that hydroelectric dams have displaced around one million people in Brazil. The demand that the company take over functions that normally fall to the state has gained force as mega-dams and other infrastructure projects that drastically modify extensive areas of rainforest and other habitats mushroom around the country. In addition, environmental laws are requiring compensation for damage caused. In the case of Itaipú, that requirement is particularly justified. It is an unusual company, run by two different national governments, and it brought in revenue of 3.8 billion dollars in 2012. 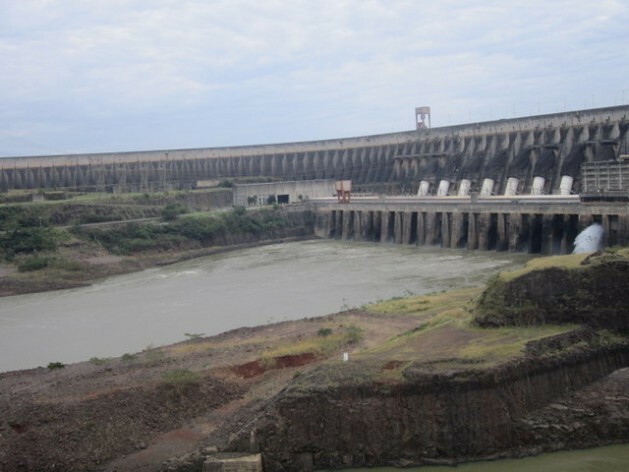 The land and rivers where the complex operates along the border between Brazil and Paraguay contain the enormous hydroelectric plant, the reservoir, 104,000 hectares of land that is under environmental conservation, the University of Latin American Integration and the Itaipú Technological Park. The CAB programme is active in 29 municipalities in Brazil covering a total surface area of 8,339 sq km, with one million inhabitants, along a 170-km stretch of the Paraná river and reservoir. The programme’s 65 activities include assistance to indigenous communities, aquaculture, medicinal plants, biogas and environmental education – a concerted effort connected by the central aim of taking care of the water. For example, CAB’s sustainable rural development activities revolve around organic agriculture as the top priority, aimed at reducing the pesticides polluting the reservoir. “We started out with 186 families; today there are 1,180 families participating, and there are 2,000 organic gardens,” said Nelton Friedrich, Itaipú director of coordination and the environment. The Itaipú Platform of Renewable Energies was also created, to protect the rivers from animal manure. The manure is converted into biogas, which generates electricity, thus creating another source of income for local farmers while curbing pollution of the water. Family farming is the main livelihood around the reservoir, where there are millions of pigs, barnyard fowl and cattle on 26,000 smallholdings. If allowed to run into the water, the manure would cause excessive build-up of nutrients and the proliferation of aquatic weeds, which reduce the oxygen in the water. This process is called eutrophication, explained Cícero Bley, Itaipú’s superintendent of renewable energies. “Pollution by organic waste is more common than pollution by toxic agrochemicals,” and in some cases makes constant cleaning of reservoirs necessary, he said. It takes nearly 30 days to renew the water in the Itaipú reservoir, compared to much shorter time-frames in other dams. On the Madeira river in the northern Amazon jungle state of Rondônia, where the Santo Antonio and Jirau hydroelectric dams just began to operate, it takes just two or three days to renew the water in the reservoirs, said Domingo Fernandez, Itaipú’s chief researcher on fish. Clean-up and reforestation are thus clearly necessary along the banks of the reservoir to keep the water healthy and productive. The CAB programme planted more than 24 million trees around the Itaipú reservoir. The initiatives follow a methodology that is also key, expanding the activities to the entire watershed, “because nature organises itself by watershed,” Friedrich said. The model followed is based on the concept of shared responsibility, involving all local actors, from public and private companies to civil society and universities, with community participation – a kind of “direct democracy,” he explained. To that end, management committees were created in the 29 municipalities, made up of an average of 57 representatives of different sectors, after numerous meetings were held for awareness-raising and debate on problems that have arisen. The so-called water pacts, which are community commitments signed in ceremonies, drive the design and collective implementation of the plans and projects. These initiatives point out a good path to follow, but are far from filling Itaipú’s social debt, said Aluizio Palmar, founder of the Centre for Human Rights and Popular Memory and a former secretary of the environment and communication in Foz de Iguaçú, the Brazilian municipality where the binational dam operates. Construction of the hydropower plant between 1975 and 1983 displaced rural families, many of whom did not hold legal title to their land, which they needed to obtain compensation. The families joined the ranks of the people living in the favelas or slums, and the rates of violence in Foz de Iguaçú shot up, Palmar pointed out. The monetary rewards, such as royalties, mainly benefited the city governments, which used the money to build shiny new government buildings and tourist attractions, while dedicating very little to cover the needs of the local population, Palmar complained. Nevertheless, the situation at Itaipú stands in contrast with the situation in other parts of the country, especially on the São Francisco river, where there is a national clamour for the river to be cleaned up and revitalised, and where there is only an incipient programme coordinated by the environment ministry. Five large hydroelectric dams with a total combined output of 10,827 MW – equivalent to 77 percent of Itaipú’s production – harness the increasingly scarce water in Brazil’s semiarid Northeast. The main portion of the river crosses the impoverished region, and besides the frequent droughts, the São Francisco suffers from sedimentation and pollution caused by human activities, such as deforestation along the riverbank, the dumping of untreated sewage, and agribusiness projects irrigated with water from the river. This is a sighting-area which have shown in this article and I must say I have got it and would like to share it with others when I will be free.